Despite never quite breaking into the mainstream consumer segment, Mazda persisted in making rotary-powered cars, starting with the classic Mazda Cosmo in 1967, and finally ending production of the RX-8 in 2012. Part of this persistence can be attributed to Mazda's commitment to sports car racing. Whatever their reasons may be for doggedly producing the engines despite their imperfections, Mazda has created a zealously loyal community of Rotary fans. It's easy to see why these enthusiasts have been enamored of the little motor. It makes an incredible--and incredibly unique--exhaust note, and the manners of the cars which have housed it are similarly impressive: the FD generation of the RX-7 is one of the most coveted cars of the last 20 years. The car revs unbelievably smoothly, and its an absolute weapon in corners. In addition, the 13B rotary engine, a mere 1.3 liters, is a favorite for those who modify their Mazdas, and high horsepower RX-7s are a bit of an automotive phenomenon. The problems which made the rotary engine such a difficult technology to sell are far from secret. Among the most difficult issues to solve is the rapid wear of the engine. Because of its radical design, the high-revving rotaries wear very quickly, and it's not uncommon for them to need to be rebuilt every 100,000 miles. To combat this problem, Mazda designed the engine to inject small amounts of oil into the combustion chamber to lubricate the usual wear point: graphite plates called "apex seals." Because of this, the car needs to be topped off on oil regularly. This is hardly a turn-on for the modern consumer, and the rotary suffered from it. Burning oil is also smokey, and the extra emissions from the oil eventually made it impractical to continue making the rotary. In addition, despite being substantially smaller in displacement than the equivalent piston-engine, the rotary was never an economical engine. These problems made it so that the cars which both suffered and benefited from the rotary appealed almost exclusively to those who had become loyal rotary fans. It may seem at first that Mazda is catering to the high-revving fanbase by reintroducing the rotary. And the fact that the engine is being implemented in an electric application seems like the problems of emissions may be mitigated. But the beloved engine is not making a return as the powerplant for an exciting RX- successor. Rather, the engine will be used as a range extender for an electric car. In other words, the engine will not even drive the wheels. It's a difficult pill to swallow for those (like myself) that have always nurtured a hope for a redesigned, more efficient rotary in a Mazda sports car. If you are not satisfied with this half-hearted use of a legendary engine, here is some hopeful (and wishful) speculation. 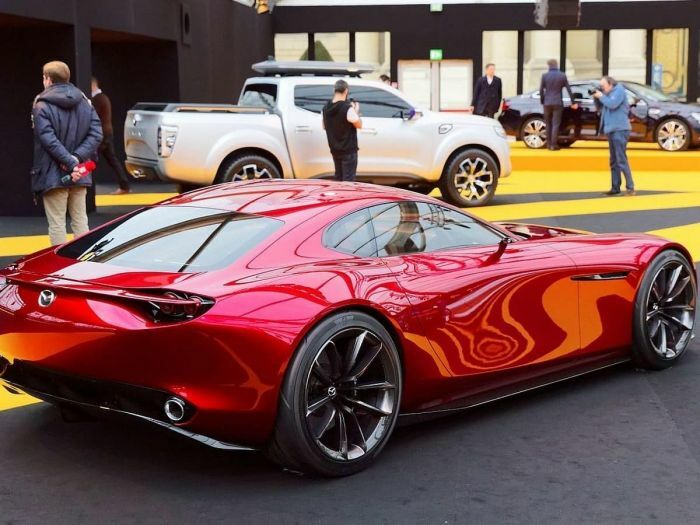 If Mazda were to reintroduce the rotary as a powerplant, using it as a range extender first would be a good way to make a soft re-entry into production. It would give the engine a less strenuous environment, since the engine would be running less frequently. It could also rev as high as it had to, which is part of keeping the engine carbon-free. So perhaps the rotary's new clothes are not the most glamorous, but it may be the start of something new. With the new, more powerful 2019 Miata, one can envision a new golden age of Mazda sports cars.